A historic route connecting San Antonio de Bexar with Spanish missions in East Texas, El Camino Real (King's Highway) once ran near the area of Buescher State Park. 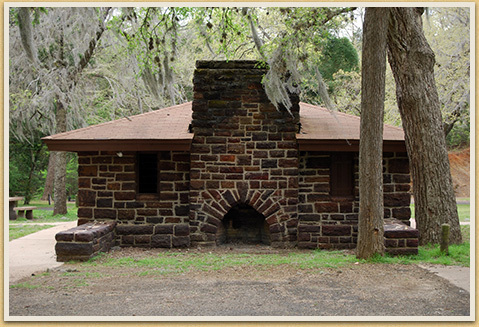 During the Great Depression, CCC Companies 1805 and 1811 improved Buescher (named Smithville State Park, prior to 1933) as a sister park to the far more ambitious undertaking at nearby Bastrop State Park and connected the two via a scenic park road through the "Lost Pines." At some 1,017 acres, Buescher State Park shares with Bastrop State Park the aesthetic goal of blending in with the landscape's rolling hills and pine forests. Architect Arthur Fehr relied on the area's rough stone and hardwood timber when he drew the designs for the park’s facilities, which center on the picturesque thirty-acre lake. Entrance Portals, Park Road 1, Road Curbs, Vehicle and Foot Bridges, Concession Building, Shelter, “Aztec” Style Settee, Chair, Armchair, and Sofa, Water Fountains, Stone Fence, Hiking Trail, Concrete Tables, Earthen Dam and Spillway, Tool House, and Pump House/Water Tower. A Keeper’s House and a Contact Station were designed but not built; instead, the CCC remodeled the Tool House and the Pump House into a residence compound in 1937.